I see pictures of people boosting big floating airs off small chop or even what looks like flat water. I sail mostly on a lake with slalom gear and I can do small "chop hop" but I've always dreamt of big floating airs. Occasionally I fluke something that feels like i'm floating and getting a bit more hang time, but now I'm getting more confidence and want to go bigger! I've seen the youtube clips for how to "chop hop" but I've never seen a "how to" about big air on chop/flat water. Anyone have any tips? Not just ramp size but also speed, and lots of it. Spot your ramp, it should be down wind of you, not out in front, bear off, gaining speed in the process, heading for that ramp. Hit the ramp, but at the same time turn back upwind, but not too much, you want the wind to hit the bottom of your board. As soon as you leave the water, pull your knees up and sheet in the sail at the same time, it's called "putting on the squeeze", and hold that position, you are now a wing. That will give you more lift and also more distance, what we call "travel air", hold it until you start heading back down, then straighten out your legs as the board meets the water, giving you the shock absorption needed for a soft landing. Always land either nose or tail first, never land the board flat, your board will hate you for that. Flat landings can kill off a board pretty quickly. For a nose first landing, hold the squeeze all the way until the nose hit the water first, it should happen naturally if you are putting on the squeeze properly. For a tail landing, come out of the squeeze earlier. Nose landings are scarier and a bit more advanced, but you come out of those very smoothly and still with some speed. Tail landings are easier but you'll scrub off almost all your speed in the process. Try to land pointing off the wind a bit, easier to get going again w/o rounding up and having to water start all over again. Below is a pic of putting on the squeeze, board up, sail down, he's heading for some distance. The waves don't look that big. He does look really powered up however. This is The Gorge. And those waves are plenty big enough. Fair point about the speed, speed is critical. Elwood ramps are probably just as big. 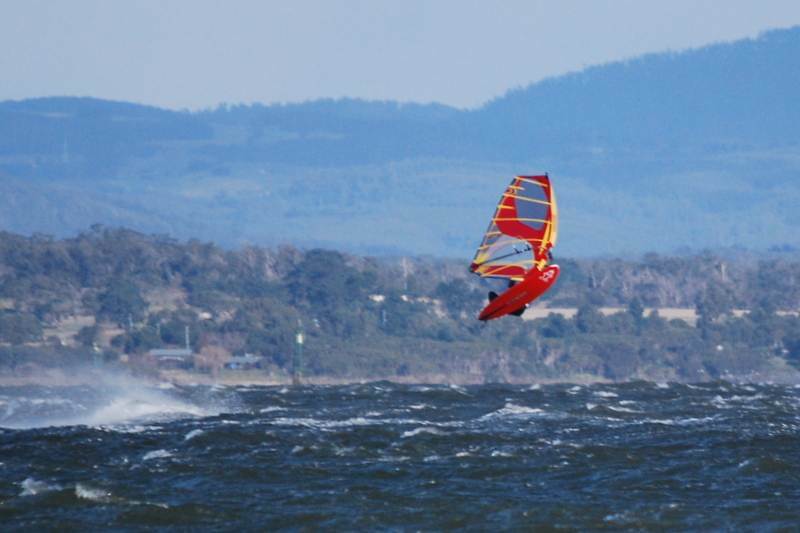 He does seem to have a big sail for the conditions and his board does not look like a typical FSW that most people would ride in such conditions. I am probably wrong on all counts. I haven't seen the Gorge ramps anywhere else and Dale Cook knows how to use them. Timing is such a key element for a good floaty jump. Speed is not as important while you develop technique so something with a bit more curve like a FSW will give you a lot more height and be a lot easier on the landings than a slalom board......so much fun .....probably my favourite part of windsurfing short of actually getting out in the waves. LOL, so I was wrong (fear has big eyes when sailing). But am I right that his sail is kinda big and he's sailing overpowered (he does look like a very strong guy). I thought you couldn't jump slalom boards? ( kill them.. )? As mentioned previously, bear away to increase speed, but then turn slightly upwind where the ramp/chop/wave is located and is steepest. If you're in a "flatwater (inland)" as opposed to "waves (coastal)" location, you will need to "spring load" yourself to achieve maximum height in the jump. Also, as per the Dale Cook video, you will need to tilt the board so that the windward rail is raised compared to the leeward rail - the stronger the wind the more pronounced the extra lift you get as the wind will aid you in getting more height in the jump. Also, on the way up keep partially sheeted in so that you get some extra lift from the sail. On the way down, sheet out to maximise "air time" as well as a softer landing. Thanks guys, that is exactly the sort of info I'm looking for. I know how to get the board into the air but not with any consistency. I think speed and the angle of my approach to the ramp have been way off. I always feel like I'm losing heaps of speed when I'm setting up on my approach. As soon as I line up my ramp and unhook I feel like I'm slowing down too much, and then that final little turn upwind to hit the ramp just kills me. Sounds like I need to be looking more downwind and going for loads more speed to compensate. I understand what you are saying about putting the squeeze on. I have felt the affects of this a few times. The feeling that you're actually floating for a couple of seconds, not just launching into the air and crashing back down. Its that feeling Im looking for more of. Then as you say Mastbender "hold that position, you are now a wing" then some stuff about landing safely too lol. Its funny with things like this that you kind of know where you are going wrong but It's not till its spelt out in black and white that it make more sense. Now I can head back out with some steps in my head to follow. I don't unhook when I chop hop. In my avatar picture I'm still hooked in. That picture is a little different to a chop hop it was more of a jump going for maximum air but if I wasn't hooked in I doubt I would have had the power to get as much Air as what I got in that photo. Mostly though by the time I land I tend to be unhooked due to the sheeting of the sail to try and get more float. I usually sail directly across or fractionally down wind then quickly turn the board aggressively windward at the ramp when im right at the base then pop the board with a bit of back foot pressure at the last second before leaving the ramp. Then I quickly tuck my back foot up under my bum which positions the board in a more downwind position during airtime which faces the bottom of the board at around 45 degrees side to side so the wind gets under it and also puts you in a better position for landing because when you straighten your legs out for landing again the board is back in a position that is sort of across the wind and you can plane out if you land correctly. 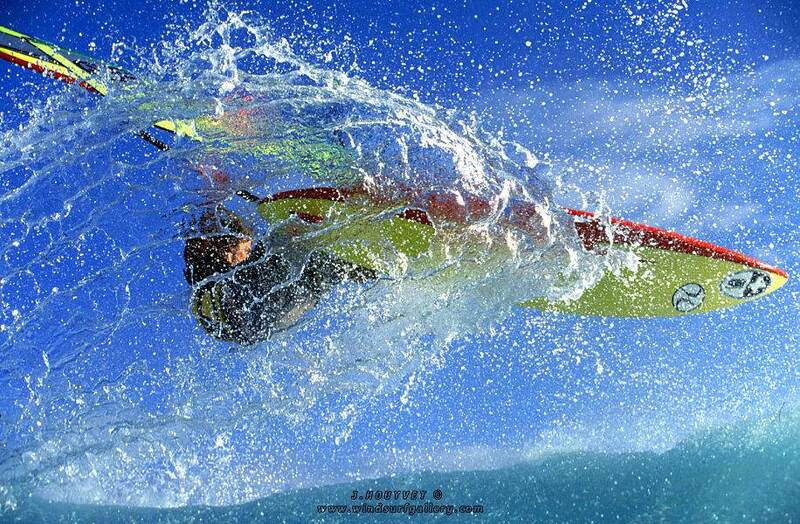 I love pulling off a good chop hop and when I really nail one it is one of the best buzzes I get out of windsurfing. Dale is using a Hucker 4.2m and is one really fit guy. Dale's using a couple of different sizes, the biggest being 5.6 and smallest a 4.2. His boards are fast slalom designs with upright fins...designed to go fast so he can jump high. The big jumps are at the Hatchery where swells can run mast high, probably the best and easiest place in the Gorge to jump. One of the keys to his jumping is the prejump and leg strength, he's one powerful puppy! I've been getting bigger air since I started doing box jumps a few weeks ago. Did the mess with the aspect ratio to make it look more impressive, or am I just cynical? 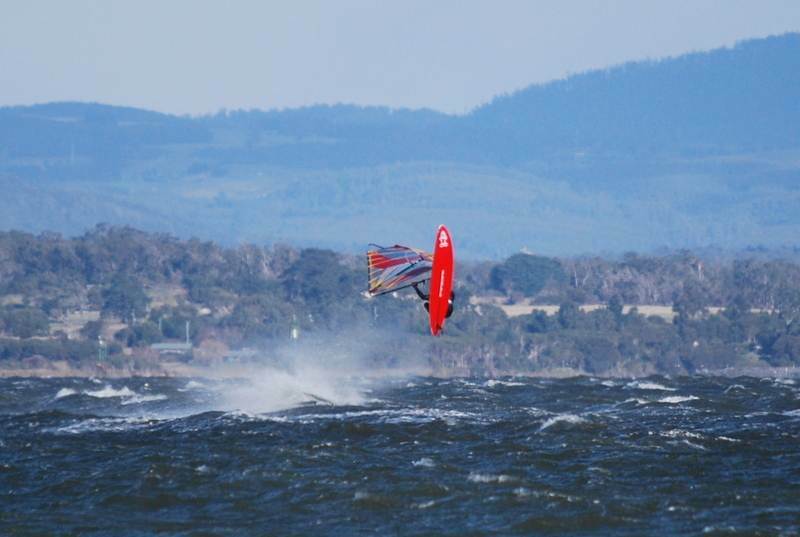 1.Wind against tide- it always makes for decent ramps, nothing as extreme as the Hatch but still sweet floaty jumps. 2.Throwing -Really throwing the gear into the jump( sending it upwards). 3.Bodyweight- same as 3. send your weight up, if you don't.. you can really kill a decent boost even if you hit a decent vertical ramp. 5.Hunting- Anticipating the chop forming from as far away as possible and hunting it down. Speed is a very big factor, and as you say, not losing speed going into the jump. Not having to turn upwind helps, so ideally you want the chop turning to about 90 degrees to the wind, but you also want a clean run at it to get speed. The more vertical you can take off, the better. Slalom boards tend to be too flat to get height. Very windy days on a short, rockered wave board can work for height, and swinging the board up above you makes it look higher. Antoine using the back of a wave for a floaty jump @1:38. Sometimes you can get a cleaner run at the back of a wave. Flat water is a lot more difficult. Some great tips in there guys. Thanks, i'm taking it all on board. Last day of holidays today and the forecast is E 15-25 but its not looking good at the moment. Hopefully I'll get a chance to hit the water for some practice. As mentioned before, but after my post, I don't unhook also, (should have mentioned that) it's not necessary, and you'll loose a bit of power in doing so. The harness line will almost always fall out of the harness during the squeeze, and if it doesn't, you'll probably get away with it anyway with a decent landing. Lots of good advice on here. Definitely "spring load" yourself when you see the chop you want to hit. Unleash as you hit it and bear away slightly once up using the sail to power you into the air then feather sheeting in/out to get the perfect flight. Remember to lift your back foot too once up to help level out board and give illusion of greater height from water surface ! Unfortunately I've only had one session since starting this thread. I was mostly underpowered so I didn't go for anything big but I tried a couple of things. Started looking further down wind for a ramp and trying to build speed on approach. I did find turning back up wind to hit the ramp a bit tricky on the slalom board (JP Slalom VI 101L) as it just wanted to keep charging downwind, so that will take some work to get right. I've gone back to staying hooked in too, unhooking was something new I got from a "how to" clip on youtube. I also had a crack at jumping off the back of a couple, which felt quite good. I've only ever got air off the back of a wave unintentionally before so I'm looking forward to working on that. So I feel like I've got it right at times in stages but not all at once, but I'm starting to get the steps clearer in my head and i can really visualize myself pulling it together. Still need to overcome a bit of the fear of throwing everything into the air at speed and not knowing where, or on what you'll land! I found a couple of photos of GClarke going big at Lagoon a few years ago. 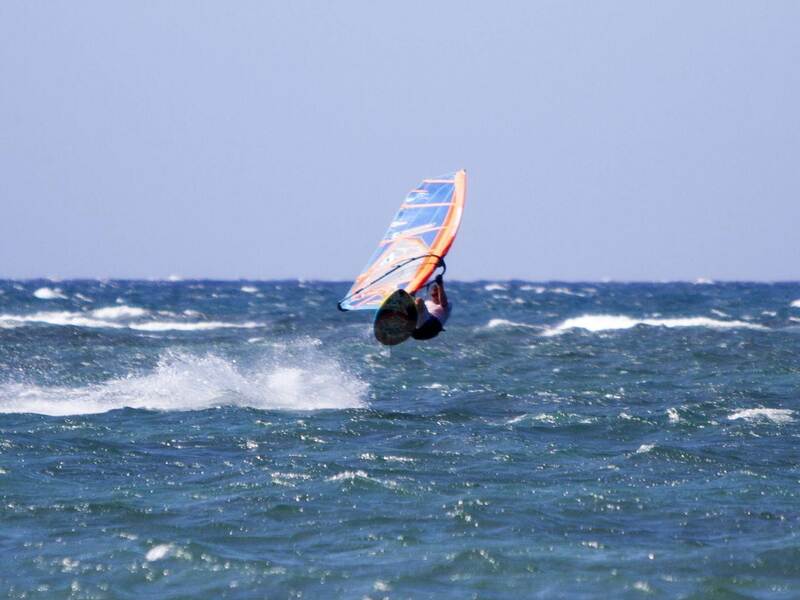 With a solid 35 to 40 knots the wind starts to feel pretty solid under the board and on this jump Geoff seemed to get hit by a second gust which floated him a huge distance. I am pretty sure he is using a 4m sail and a 68 l Acid. More than enough for those conditions. In that breeze that would take balls. Looks great!